Highway congestion has increased dramatically over the past two decades. At its most fundamental level, highway congestion is caused by the lack of a mechanism to efficiently manage use of existing capacity. Economists have long advocated that pricing the costs of congestion directly is the most viable means to address this problem and reduce overall congestion costs. As stated in the 2007 Economic Report of the President, small changes in the number of cars using a particular roadway at a given time can result in significant impacts — for good or bad — in the flow of traffic. For instance, the addition of just a few school buses makes traffic flow noticeably worse on the first day of school, while traffic flow is noticeably better on some State holidays when only a small number of residents stay home from work. Congestion pricing dampens demand for roads during peak hours and spreads usage over a longer time period. Differentiating the price of a good by the time of day effectively allocates limited capacity during periods of higher demand. As travel and congestion continue to increase, HOV/HOT lanes and other travel demand management techniques will be found to be increasingly valuable as strategies to reduce congestion and improve air quality. An investment in HOV and HOT lanes demonstrates a region’s long-term commitment to plan for and make cost-effective investment decisions that reduce congestion and positively influence the mobility, safety and productivity of multi modal facilities, corridors and metropolitan transportation systems. In locations where HOV lanes are underutilized or where anticipated excess capacity on the HOV facility exists, conversion to HOT lanes is suggested as a way to increase use and to provide more choice to drivers. The FAST Act amends (23 U.S.C. Section 166) to provide States more flexibility to manage the operational performance of HOV lanes by allowing certain vehicle exceptions when existing or anticipated excess capacity exists. A key to ensuring the effectiveness of HOV/HOT facilities is to continuously monitor and evaluate their operational performance and then make necessary adjustments. Enforcement is also critical to the successful operation of an HOV/HOT facility. The role of an HOV enforcement program is to protect the integrity of the facility by deterring possible violators, thus promoting the safe and efficient use of the HOV lanes. Some of the typical indicators of efficient HOV/HOT lane performance are: high vehicle and people throughputs, reliable travel time and transit services, and low violation rates. In locations where HOV lanes are underutilized or overcrowded, States may apply one or a combination of the following operational strategies to optimize the HOV lanes performance. The following sections will explain how these operational strategies can potentially enhance the performance of HOV facilities. Many HOV lanes do not make full use of their capacity. Consequently, more SOV/LOV traffic than necessary is forced to use congested general-purpose lanes. Congestion can be reduced, and the overall throughput of the highway corridor can be increased, if an HOV lane is converted to a HOT lane, allowing vehicles that do not meet the established minimum occupancy requirement to use the HOV lane on payment of a toll. The "trade off" benefit to paying to use an HOV lane is an increase in trip reliability, as the HOV lane is required to be monitored for compliance to maintain speeds. Ideally, the HOV lane-user will proceed at a fairly uninterrupted pace while the adjacent general-purpose lanes may clog during peak hours. Outside of peak hours, the G-P lanes may clear and a tolled trip in the HOV lane may be unnecessary. Picture showing the left lane is for free HOV 2+ and the right lane is for tolled traffic. The U.S. Department of Transportation strongly endorses the use of HOT lanes as an effective strategy to address congestion. The toll should be varied in accordance with travel conditions and should be set at a high enough level that the performance of the HOV lane is not degraded. This optimizes the vehicle throughput of the HOT lane and reduces congestion in the general-purpose lanes by drawing off some of the SOV traffic that would otherwise be forced to use those lanes. So HOVs are no worse off, and vehicles that do not meet the vehicle occupancy requirement, whether they use the HOT lane or the general-purpose lanes, are better off. The FHWA encourages States to take advantage of the use of the HOT lane option provided in 23 U.S.C. 166, so long as the performance of the HOV lane is continuously monitored and continues to meet specified performance standards. States should consider converting HOV lanes to HOT lanes whenever the capacity of the HOV lanes is underutilized and congestion occurs in the general-purpose lanes. It is, of course, important that States be prepared to comply with the statutory criteria for establishing a HOT lane - automatic tolling, dynamic tolls that vary with the level of congestion, adequate enforcement, and ongoing performance monitoring, evaluation, and reporting and modification of operations when approaching degraded conditions. The toll amount should be varied based on historical highway use and/or real-time traffic conditions. Chapter IV provides the definition of a degraded HOV lane. 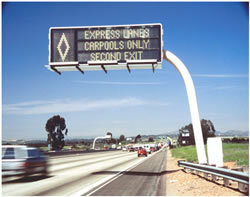 Picture displaying overhead sign reading "Express Lanes Carpools Only Second Exit". In instances where the State wants to implement a HOT lane, but does not yet have a program addressing how motorists can enroll and participate in the program, an automatic toll collection system, or policies and procedures to vary the toll amount and enforce violations, the FHWA has determined that the State can proceed to implement its HOT lane so long as the State is committed to full implementation per each of the section 166(b) and (C) provisions. If the State cannot fully implement these provisions within the stipulated time, then the State's toll authority may be revoked. Despite their potential benefits, HOT lanes are often portrayed as "Lexus Lanes" in the media. The contention is that only higher income drivers (i.e., only ones that can afford Toyota Lexus-priced vehicles) can take advantage of these facilities, while lower income drivers must continue to be stuck in traffic. In the 2007 Economic Report of the President, one study found that drivers with higher incomes may indeed tend to use HOT lanes more often than lower income drivers, but that lower income drivers certainly rely on toll lanes when on-time arrival at their destination is important. Other more recent surveys found that support for, or opposition to, HOT lanes is more related to time savings, and less related to income. It is the position of the U.S. DOT that HOT lanes provide direct choices and direct benefits to the subject users, and indirect benefits to non-users, e.g., by removing vehicles from the G-P lanes and using excess capacity in the HOV lanes. The HOV/HOT goal is to encourage the use of carpooling, vanpooling, and transit services, and to allow toll-paying customers to fill excess capacity and enjoy a more reliable trip, all without overloading the capacity of the HOV lane. Additional factors to be considered in connection with HOV to HOT conversion include public acceptance, toll schedule/structures, the cost of the tolling infrastructure and operating strategies, use of revenues generated from the project, identifying qualifying vehicles, and methods to restrict use. HOV facilities offer States the ability to match vehicle eligibility criteria and vehicle occupancy requirements to the demand for the lane. Under 23 U.S.C. 166 (a), the States retain the authority to establish the minimum occupancy requirements of their HOV lanes, so long as the minimum occupancy is no less than two. The goal is to set the occupancy requirement at a level that will encourage the use of carpooling, vanpooling, and transit services without overloading the capacity of the HOV lane. 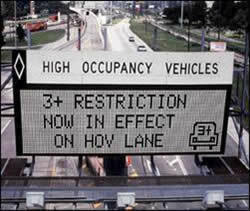 Picture displaying a sign reading "HOVs – 3+ Restriction Now In Effect on HOV Lane"
Changes in the designated vehicle-occupancy restrictions may be needed over the life of an HOV facility. For example, some HOV lanes using a 2+ requirement have experienced congestion resulting in reductions in trip time reliability and slower travel times. This situation happened on both the I-10 West and U.S. 290 HOV lanes in Houston. To address this problem, the vehicle-occupancy requirements were increased to 3+ during the morning and afternoon peak-hours. States are strongly encouraged to increase vehicle-occupancy levels in the event that facility performance becomes degraded. In locations where HOV lanes are overcrowded, States may combine pricing and occupancy requirement modification strategies to improve performance. States should set an occupancy requirement that reasonably facilitates the use and operation of carpools. In other words, States should establish the occupancy requirement at a level related to the performance of HOVs on the facility. For example, it is highly unlikely that many private vehicles that are used for carpools will be able to meet a 10+ occupancy requirement. Currently, the FHWA does not know of any HOV lane with an occupancy requirement above four. Therefore, a rebuttable presumption is created where the FHWA will presume that any HOV occupancy requirement over four bears no relationship to the performance of the HOV lane. A number of factors may need to be considered in assessing possible changes in vehicle-eligibility requirements for an HOV facility. The exact factors and issues will vary by metropolitan area and by the type of change in the vehicle-eligibility requirements being considered. Typical factors include HOV project goals and objectives, facility type and length, design treatments, congestion levels in the HOV lane and the general-purpose freeway lanes, bus operations, system connectivity, and supporting services and facilities. Other important factors to consider include safety, enforcement, and perceptions of HOV lane users, non-users, and policy makers. Picture of car with "Clean Pass Vehicle" sticker on the bumper. One option to use excess HOV lane capacity is to allow environmentally friendly vehicles that do not meet the occupancy requirement to use HOV lanes for free or for a fee. The concept is that this benefit (i.e., free travel in HOV lanes) may stir buyers to purchase environmentally friendly vehicles. However, it is assumed that over time "eco" vehicles may become more common. As stated elsewhere, this benefit may be sunset unless it is extended or continued by Congress. As stated in 23 U.S.C. 166, States are authorized to permit ILEV and/or qualified low emission and energy-efficient vehicles (i.e., hybrid and alternative fuel vehicles) to use HOV lanes without meeting minimum occupancy requirements. States may also allow eligible public transportation vehicles that do not meet minimum occupancy requirement, such as out-of-service or deadheading transit vehicles as defined in 23 U.S.C. 166(b)(3), to travel on HOV lanes free of charge. In addition to the pricing, occupancy requirement, and vehicle eligibility operational strategies, other travel demand management strategies can also be used to improve HOV system performance on both a region-wide and facility-specific basis include: guaranteed ride home programs; telecommuting and alternate work schedules; growth management, land use policies, and zoning ordinances; parking management; trip reduction ordinances; and traveler information systems.